In the Golden Age of Hollywood, at the height of production of the great serial movie adventures, the most successful serial of all features a man in a Bat-suit, fighting crime and striking fear into the hearts of evildoers. 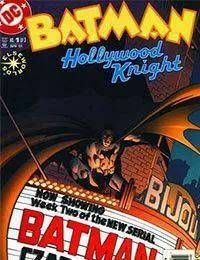 But this fiction soon becomes a reality in this three-issue Elseworlds mini-series. Byron Wyatt is a successful actor/director/producer, whose independent film company, Gotham Pictures, creates the Batman serials based on the popular comic-book character. But Wyatt (who stars as the Batman) and his success threaten to undermine the big studio Arkham Pictures, run by mogul Jack the Joker Napier. After several threats from Napier fail to sway Wyatt from stopping production of the serials, Napier uses his mob connections for a more permanent solution to his problem. After the mob kills off the production crew and sets fire to the sets, they find Wyatt in costume and shoot him in the head. Only Wyatt doesnt die. When the actor regains consciousness from his near-fatal head wound, he has no memory of his true identity. Instead, he only remembers his life asâ¤|the Batman, and is consumed with a thirst for vengeance for the murder of his friend, Byron Wyatt. Will his memory fully return before the ultimate confrontation with Napier? And if so, will he still have the fearlessness of the Batman to bring Napier down for good?